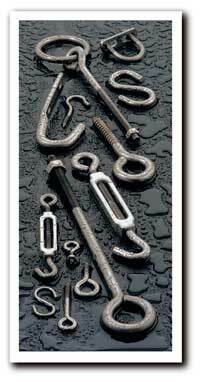 J-bolts, Screw Eyes and Hooks are offered with lag or machine screw threads. Hindley also manufactures a complete line of U-Bolts with threads up to 1/2". These as well as Eye and Hook Turnbuckle Combinations, "S" Hooks and Cotter pins to MIL specs are stocked in Steel/Bright Zinc or Stainless Steel. Hindley products are available in shelf boxes, blister cards, Pic-Paks, Stor-Paks and in bulk packaging and can be ticketed with UPC bar codes. Hindley products can be merchandised on plan-o-gram and wire rack assortment. 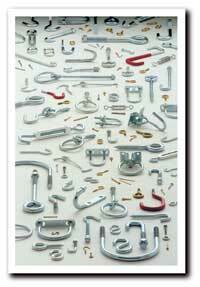 Manage the elements with Hindley's newly expanded line of 300 series Stainless Steel Wire Hardware. 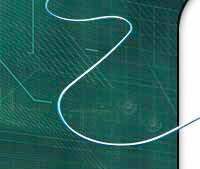 click on one of the items below for a Hindley standard wire form quote/order form.